To celebrate our 10th Anniversary we are delighted to announce in association with Ireland West Airport and Mayo.ie our fantastic GIVEAWAY!! Each participant will be entered into a draw for a chance to win a trip for 2 on the very first flight from Ireland West Airport to Cologne. Included in the prize will be accommodation and spending money. All inclusive to the value of €1000. Join us for the celebrations this one will prove to be the biggest and best yet! Avail of our special 10th Anniversary package tshirt, medal, goody bag and a chance to win a trip for 2 to Cologne Germany. 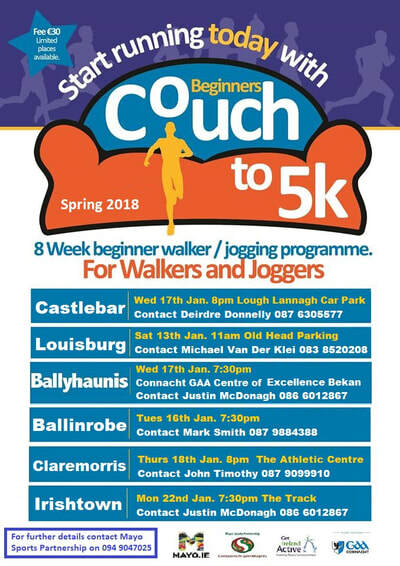 Check out the many Beginners Couch to 5K Programmes running throughout the County. These are an ideal way to prepare for the 10th Anniversay West of Ireland Women's Mini Marathon on Sunday May 5th 2019.